Make sure your Lightning devices are always fully charged with the Techplus MFi Lightning Cable to USB Cable in Grey for Apple Lightning compatible devices. This cable is certified MFi by Apple for use with their products. 1 Metre length. It was delivered on time and it works well. 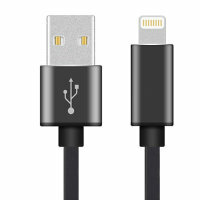 This quality cable allows you to connect your Lightning compatible hardware to your laptop, in order to charge your phone and exchange / sync data simultaneously. With a standard USB connection this cable is compatible with a mains charger featuring a USB input, as well as a laptop or PC - so you have complete flexibility for your charging needs. The 1m length of this cable allows you to reach USB ports or plug sockets with ease.